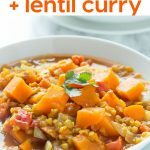 A really easy Sweet Potato and Lentil Curry that’s gluten free and Vegan too! I think it’s fair to say that in our house any kind of curry would trump most other dinner options on any day of the week, especially if it’s my husband that’s choosing the menu! I’m from Scotland and curry is as popular back home as Mexican take out is here, it’s also affectionately known as Scotland’s ‘other’ national dish. 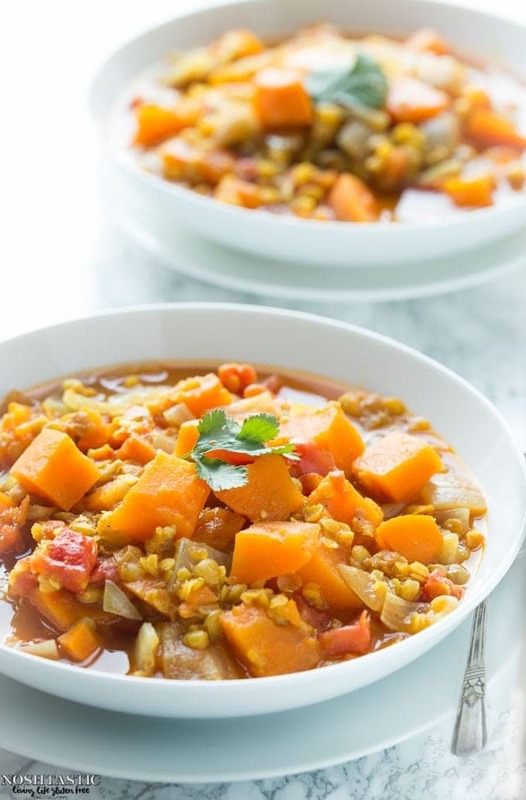 Curry is a fairly broad term and encompasses food from several continents but the curries that are most common in Scotland typically come from India and Pakistan. I suspect that most people who have never tried any type of curry associate it with super spicy food but that’s not always the case and the spiciness can be adjusted to suit your palate. 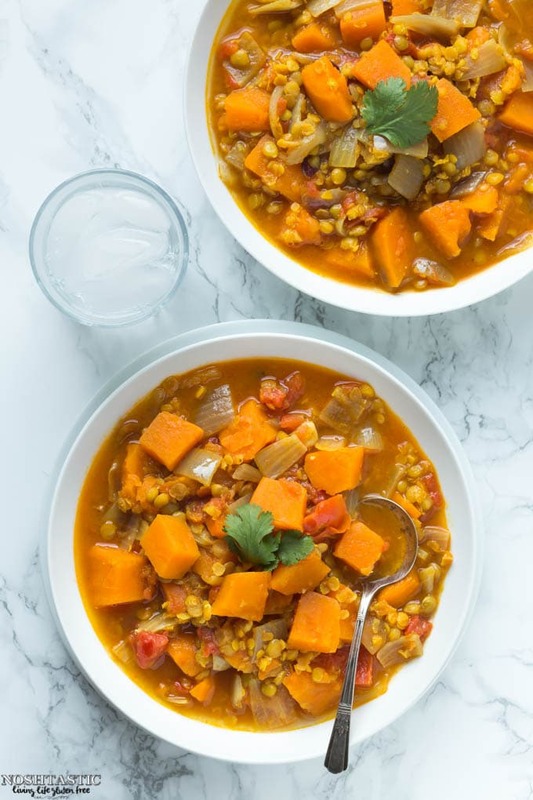 My Sweet Potato and Lentil Curry is a very mild vegan curry, the only chili powder added to it is in the curry powder so unless you have a hot curry powder it will not set your mouth on fire. If you’re like my husband and like it a bit more spicy then you can add some additional chili powder to kick it up a notch. It’s also a very healthy and cheap dinner option, I don’t think you’ll miss the meat. If you can find Naan bread in your grocery store (or make some yourself) that would be a perfect accompaniment. I can’t tolerate dairy any more but if you can then a large dollop of natural yoghurt on top would also be a great way to serve it. Heat coconut oil in a large pan and add the chopped onions and garlic, cook on a medium heat until they soften a bit. 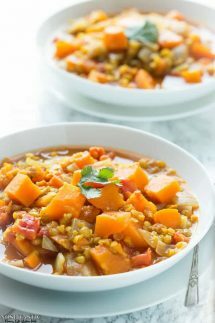 Add the curry powder and cumin seeds and cook for a minute or two, then stir in the lentils, ginger, sweet potatoes, broth, and diced tomatoes. Bring to the boil then cover and simmer gently for 20 mins or until the lentils and sweet potatoes are cooked. Don't overcook it or the sweet potatoes with turn to mush! Season with salt and pepper and garnish with cilantro leaves. serve with flatbread such as naan, and if you eat dairy natural yoghurt works well too. This is typically a very mild curry, the only chili powder added is what's included in the curry powder mix. That said, curry powders are often labeled mild, medium, and hot so make sure you check the label before you use it! If you want additional heat you can add some chili powder to kick it up a notch. This is a lovely dish and LOVE the new name 🙂 Sharing! Thank you Summer, It such a simple dish but very tasty! Thank you! It’s a really nice combination and a very light curry, hope you enjoy it! Oh, what a delicious recipe! I had it every day for lunch until it was gone, and immediately wished I had another batch prepared so I could have another helping. This is already in my regular rotation. Thank you so much! Hi Sylvia, thank you so much for commenting and letting me know how much you enjoyed the curry! Did you use lentils straight from the bag or did you hydrate them overnight? Hi Deb, Eeeek! I forgot to add them in, so sorry! I just updated the recipe. I would add the garlic with the onions and the ginger with the lentils, but if you are past that part you can just add it in at any point. Thank you! I am past that, but smells fab and I am sure it will be delicious! Green lentils- I used French Lentils and they did not cook through. What do you mean by green lentils? Hi Peggy, I’m not sure if French Lentils are the same as green lentils, the ones I buy at the store simply say Green Lentils on the pack and the cook time is 15-20 minutes on the back of the packet. How long does it say to cook yours for? If it’s longer than 20 minutes I would cook everything but the sweet potatoes, and then add them in for the last 20 mins. Thank you! It was really yummy. Will make again! !